When I started this blog, I vowed (to myself) that I would not be entirely biased, meaning I would not always include only positive comments about Rachael Ray. So, here is my attempt to provide the other side of the coin, but as you will see below, I could not resist the urge to rebut what was said! 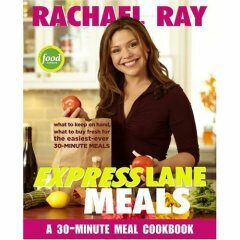 No review of Rachael Ray's newest book, Express Lane Meals, appears to be published without a test of one of the recipes to see if (1) it can be made in 30 minutes and (2) if it stinks. We were unable to make it, as the book promises, in under 30 minutes. Instead, it took us at least 45 minutes, from start to finish. One thing that slowed us down was having to grate the cheese. I had been unable to find a tub of freshly grated Pecorino Romano at the grocery store. I suggest ignoring her instructions to put the cooked spinach in a clean kitchen towel to wring the water out. That will leave green stains on the kitchen towel, making more work. Instead, try using the back of a spoon to press the water out of the spinach. And, she seems to have a love affair with extra-virgin olive oil, or EVOO as she refers to it. She uses it in everything. After eating the Cacio e Pepe and Spinach with White Beans, our plates were slick with excess oil. The dishes were quite tasty, but if making it again, I'd cut back on the amount of olive oil drizzled over the cooked pasta. Generally, I just offer these reviews and leave it at that. But for some reason, this time I feel compelled to respond. Maybe this compulsion stems from the fact that this review picks up on many of the nitpicky things people usually say about Rachael Ray. But, in all honesty, I think the real answer may be that the slightly condescending attitude towards her is prevalent in this article and it gets under my skin. So anyways, if you don't want to read my rant, I suggest spending your time going here to figure out which food network star you are. Otherwise, here are my comments. First, I guess I should be indignant when Rachael's recipes are not complete within exactly 30 minutes, but I just can't work up the emotion about it. If it is made in close to 30 minutes and meets the quick and easy cooking idea, then I am not too worried if it takes 45 instead of 30 minutes. And you gotta wonder if they follow the tips and tricks that Rachael uses to reduce the recipes to 30 minutes, such as the garbage bowl, chop and drop, and cleaning veggies when you bring them home. Second, I use towels for draining the spinach. Getting all the water out is really important to the texture of the dish and I don't think a spoon really does the job. It stains the towel a little bit, but I just always use the same one. Third, yes, she uses a lot of olive oil. But olive oil is good fat (monosaturated). Now, as far as how much oil she uses, she is always saying that you should tailor the recipes to your own taste and often remarks that you should eyeball it. I assume if the author had eyeballed the oil, maybe she would not have included so much. And with that, I step down off my soapbox! I completely agree with your rant! I'm so sick of people criticizing Rachael for her quirks or her recipes taking a whopping 5 minutes longer than 30 minutes. I think you touched on a good point in regards to people possibly not taking all of Rachael's recommended time short-cuts, too. Some people just want to complain about anything and she seems to be a favored punching bag lately. Oh well, I love her and her quirks, along with her self-depracating humor. I really enjoy this blog, too! Thank you, Teresa! It is nice to hear some affirmation. And, thanks for reading - I love writing it!